A sharply divided Washington state Supreme Court has denied all motions to reconsider the constitutionality of charter schools. The announcement came late Thursday — just hours after some 400 students, parents and educators descended on the state capitol to lobby for support. The decision leaves more than 1,000 families uncertain whether their schools will stay open beyond the 2015-16 academic year. Nina Rees, president and CEO of the National Alliance for Public Charters, called the decision “devastating.” A lawyer representing the League of Women Voters, Washington Education Association and other plaintiffs said they were pleased with the outcome, according to local media. Local lawmakers, attorneys general and organizers fought for a reversal of the court’s Sept. 4 ruling, which stated charters were not “common schools” by virtue of having appointed — rather than elected — boards and therefore not entitled to basic education dollars. In 5-to-4 split against reconsideration, the court agreed to remove one footnote from its prior decision, which charter advocates previously argued called into question the constitutionality of other state education programs, such as tribal compact schools and vocational programs. Parent Jessica Garcia, who boarded a bus to Olympia, Wa. early Thursday morning to the rally, says the latest decision leaves her in utter shock and disappointment. At the capitol, Garcia shared her story of fighting to get Isadora educational alternatives after watching her older autistic son get bullied in a traditional public school. The family couldn’t handle the financial burden of private school but found Destiny to be a perfect fit. Inside a joint Senate committee workshop, students, parents and school administrators passionately shared testimonies of how their charters made a difference. Students from Excel Public Charter School, a STEM-focused middle school in Kent, talked about the difference in the school’s rigor — a difference they insisted inspired them to attend college. Sen. Bruce Dammeier, a Senate Republican leader on education issues, said the court’s decision was disappointing, especially considering how many stories lawmakers heard Thursday about how charter schools were benefiting students. A bipartisan group of 10 state legislators were among those asking the court to rehear the charter case. Thursday's rally was organized by a newly launched coalition, ACT Now for Washington Students, which includes the Washington State Charter Schools Association, Democrats for Education Reform, the League of Education Voters and Stand for Children. 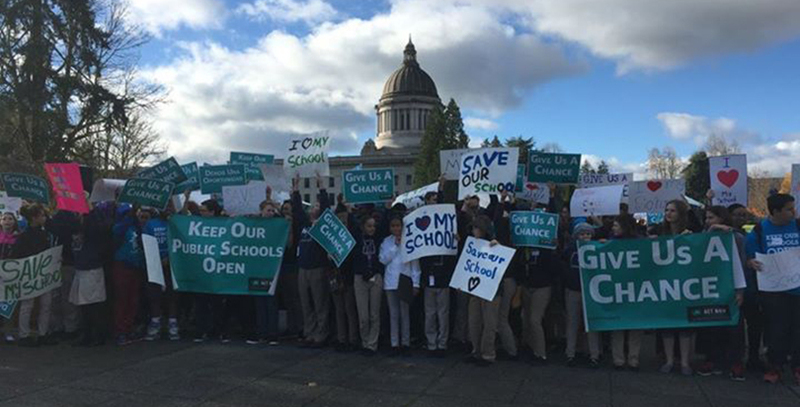 The coalition called Thursday’s decision “harmful” and “disrespectful to Washington voters,” urging legislators to find a permanent solution that would allow schools to remain open. Roland Bradley, grandfather of a 12-year-old Excel student, says he wasn’t surprised at all by the court’s decision. He too is looking to the Legislature to make the difference. “While the court declined to revisit its holding regarding charter school funding, it is now up to the Legislature to decide whether to adopt a different mechanism to fund charter schools,” said Attorney General Bob Ferguson. Ferguson has also filed for a stay of funding for the schools through the 2015-16 school year. The operating budget across Washington’s nine charters is estimated to exceed $14 million. The court left that issue undecided Thursday. Voters approved charters in 2012 after three failed attempts at the ballot but opposition groups filed a lawsuit soon after.